So, without further delay, here's K9 Magazine's countdown of a few of the best Spring products for you and your dog! 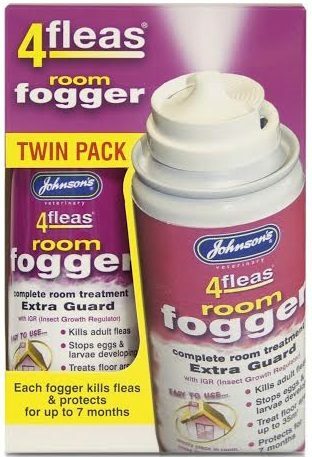 4fleas Twin Fogger – Johnsons have two major products to eliminate fleas in the home under their exclusive ‘4fleas’ veterinary strength brand, available without a prescription from your local pet shop. The UK’s no.1 selling 4fleas Twin Fogger is a single room treatment easy to use and effective (treats up to 90m³) and is perfect for today’s busy life styles with a simple – ‘place in room, press nozzle and leave’ application. Soft Mesh Dog Harness Range – Designed by Urban Pup to provide the ultimate in comfort and safety, the stylish harnesses feature a breathable material for maximum air circulation that helps prevent your dog overheating and is held in place by a secure clip in action. Featuring a sturdy D ring for lead attachment, it’s also trimmed in black which besides being stylish is also practical in that it will not get dirty easily. Monthly Treat Box Subscription for Dogs – Woof-Box has launched to deliver happiness to dogs everywhere! Tailored to their owner’s specifications, Woof-Box will handpick and deliver only the healthiest, tastiest snacks, treats and other goodies to the doors of dogs across the UK every month. Scruffs Balmoral Boot Bed – With Spring here and Summer on it’s way, this boot bed is an ideal travel accessory for your dog. Suitable for most cars, the ribbed sleep area provides comfort for your dog while protecting your boot from dirt and odour. To use, place the bed on the floor of your car boot and unroll to protect your dogs legs as they get in the car. Then, simply roll the cover up to form the forth side of the bed. Machine washable, it’s available in Blue, Black or Brown. Gtech AirRam & Multi – This lightweight, cordless AirRam cleaner is revolutionary. Making it easier to clean, especially while dogs are shedding as the seasons change, the AirRam allows you to glide from room to room, carpet to hard-floor with no settings to change. The GTech Multi accompanies as a cordless attachment making it easier to clean dog beds, stairs and those hard to reach places.